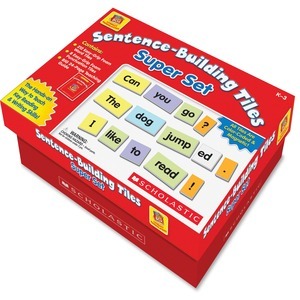 Sentence-building, tiles super set features magnetic foam, color-coded word tiles plus punctuation tiles that can be combined to build thousands of meaningful sentences. Set helps children develop reading fluency, understanding of word relationships, parts of speech and beginning writing skills as they build simple sentences and practice reading them. Using these tiles help children develop concepts of print and word relationships, explore usage of nouns and more. Teaching guide allows you to create a more comprehensive experience. Set is designed for children in kindergarten through third-grade.